Julian Wessel photo and video of ISS and Saturn was not real. Wessel didn’t do this; on his website he said, “I managed it [sic] to photograph the ISS in front of a planet again. 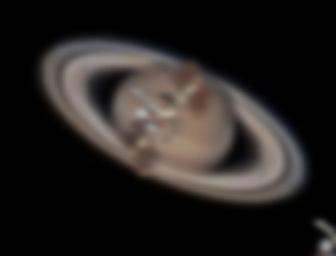 In this case it was the Lord of the Rings: Saturn.” He also wrote, “Fortunately everything happened as planned and I could make the capture… You can see the Video of the Event on my YouTube… This is a great effort for me as an astrophotographer. It takes time, patience, preperation and a little bit of luck to get a shot like this, but at the end the hard work pays off!” That certainly makes it sound like he got footage of the actual event. He also submitted it to the Astronomy Picture of the Day site, which ran it (though, after review, they have since taken it down). Zoom on the actual transit portion of the photo. 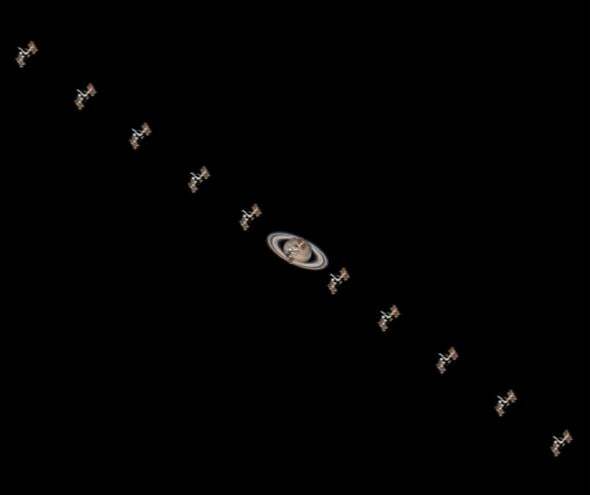 Note that the ISS should be twice as big as Saturn, and there are too many details in the image given the conditions at the time the photo was claimed to be taken. Yes, I checked, and this one looks real! It is possible to get this sort of thing on video. Like I said, it takes patience and planning, and maybe a bit of luck, too. See? Astronomy is really cool. I suggest following FakeAstropix and PicPedant on Twitter to see if that viral pic you saw on Facebook is real or not. A Fake and a Real View of the Solar Eclipse … FROM SPACE! Is That Viral Quadruple Rainbow Picture Real?